NEW YORK — About 200 Bronx and Queens residents were still without power as of Thursday early afternoon after strong winds and rain blew out services, according to Con Edison. Most of the 205 residents without electricity Thursday afternoon lived in the eastern part of Queens, with 79 of them in Flushing. The outages, which peaked at 1,230 on Thursday morning, hit mainly in the eastern parts of Queens and The Bronx, affecting neighborhoods such as South Jamaica, Cypress Hill, Hunts Point and Castle Hill. A few power outages were also reported in Brooklyn neighborhoods, including Gowanus and Bensonhurst, according to the company’s power outage map. 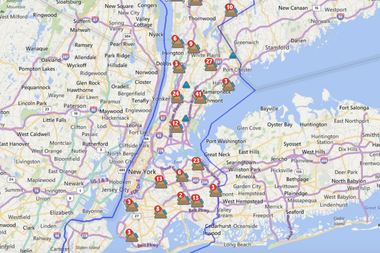 Overall 630 power outages were reported in Queens and 600 in The Bronx on Thursday morning. The National Weather Service on Wednesday advised that wind gusts in excess of 60 mph were expected overnight. Con Edison's crews will give priority to restoring service lines that will provide power to the most customers, then move on to restore smaller groups and individual clients who are without power, the company said in a statement. The company asked customers to stay away from downed power lines, and to report any downed lines to Con Edison or the police.